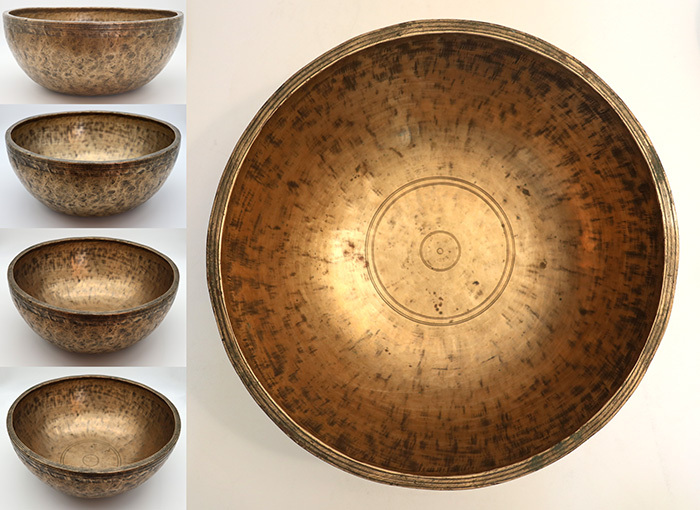 This magnificent large antique Jambati Singing Bowl has a very beautiful third octave C# fundamental with a pronounced pulse and long sustain when struck with a padded mallet or played around the rim with a suede ringer. This is a large and heavy bowl with a diameter a touch over 12 inches and weighing almost 3 kilos. It has a substantial physical presence and something of the wow factor! This is in part due to its size and shape (the slightly low profile making it appear even bigger than it is) but mainly because of the glorious golden sunburst-like hammer markings of its interior. It has been expertly crafted and features a wide, grooved, and triangulated lip, with decorative banding forming a collar around the outer rim, and there are well-defined circles at its centre. This fabulous large antique Jambati Singing Bowl is in excellent structural condition, clean and free of stains and blemishes. A Tibetan silk brocade bowl cushion, a padded striker and 2 ringers are all included in the price.